As you know, I travel often and each destination offers its own special charms. But sometimes when I wander around in a new place I instantly know it is special…unique. Such was the case in Heidelberg, Germany. Originally it was just one city of many on an 11 day itinerary, but once I stepped foot in the historic center of this gem of Germany, I was captured by its spell. I’m not sure words can accurately describe it, so I give you photos and a few highlights. 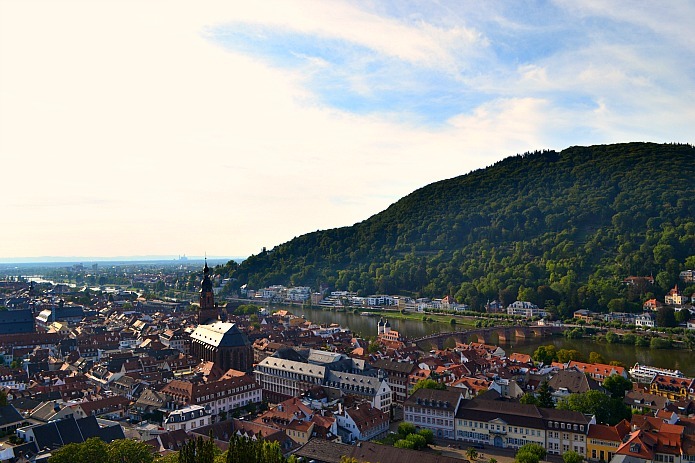 Straddling the Neckar River and surrounded by tree-covered hills, Heidelberg couldn’t be more picturesque. Baroque houses, winding cobbled streets, and a graceful old town bridge spanning the Neckar River make for a most romantic scene that has served as an inspiration for poets and writers for centuries. The best way to explore this area is with a guided tour of the old town where the past comes to life. The city center is home to Hauptstrasse, the longest pedestrian-only street in Germany with a wide range of excellent shopping options. Most impressive is the Church of the Holy Ghost that dominates the Marktplatz. Originally built in the early 1400s, the church has shifted between Catholic and Protestant several times over the last 600 years. At one point in the early 1700s it was partitioned so that both religions could use the church. 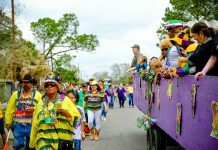 Who knew Catholics and Protestants could share? If only it were the same for Republicans and Democrats! Look closely at the stained glass windows. They were blown out during the war and have been replaced by the works of modern artists in a variety of styles. Founded in 1386, Heidelberg University is the oldest university in Germany. It has attracted scholars to Heidelberg for centuries and has produced an impressive list of Nobel Prize winners. The university’s magnificent neo-Renaissance Great Hall was built in 1886 to celebrate the institutions 500th anniversary and serves as the venue for ceremonial events. The ceiling frescoes feature the four faculties – theology, law, medicine and philosophy. Standing at the podium overlooking the hall it is easy to imagine the students waiting to receive their professor’s wise words. 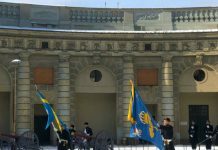 Between 1778 and 1914, students who misbehaved were detained in Studentenkarzer (Student Prison). The prison began as a means to control rowdy college boys who disturbed the peace by letting out the locals’ pigs and partying into the wee hours of the morning. Fed up with the noise and disruption, the townspeople created the student prison. But these boys were from influential families of wealth and could not be detained from attending their classes which meant they could come and go as they pleased. The prison quickly became something of a rite of passage and a party zone as food and wine were delivered upon request. 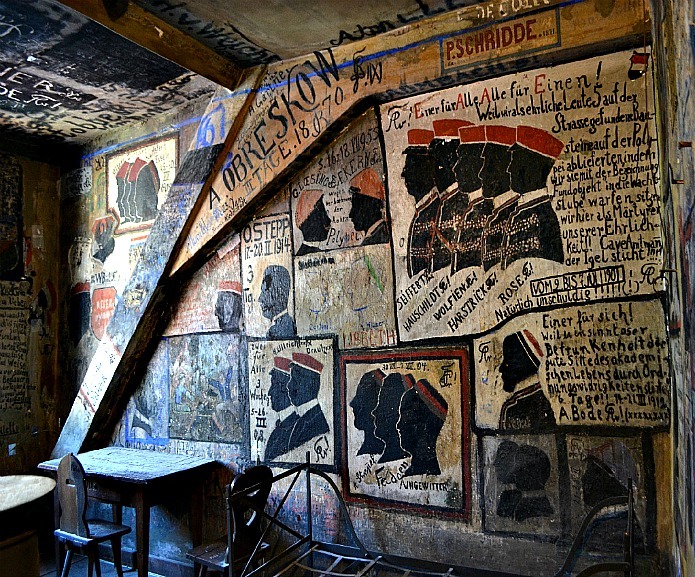 The old prison walls are covered in graffiti drawn with soot and chalk that tell the humorous stories of these bad boys. Located in the beautiful Neckar valley with views of the Neckar River and the slopes of the Odenwald mountain range, the Stift Neuburg Monastery has existed for almost 900 years. 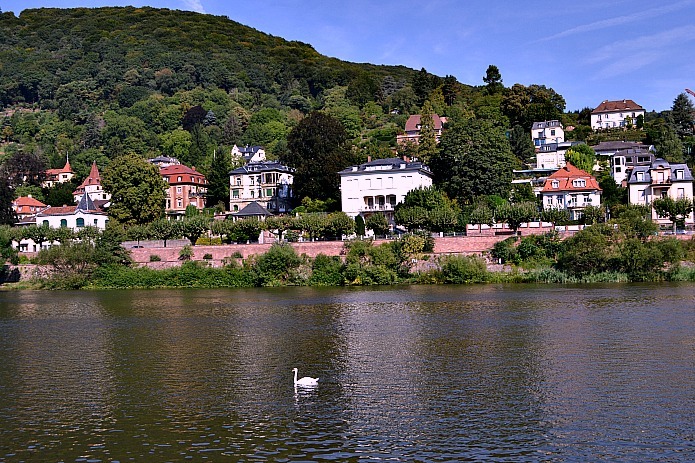 It is possible to hike to the monastery from Heidelberg, but I chose the easy route – traveling by boat. Getting out on the Neckar River provides a completely new perspective of the city. The ride travels through three locks, past the lush landscaped hills and on to the monastery. Brother Bruno met us and gave us a guided tour of the abbey. Our tour included the crypt where Brother Bruno pointed out the date of birth listed on each stone was actually the date of death. Monks celebrate death as the birth of their eternal life. On the grounds, a small farm shop sells cheese and other goods produced by the monks. You can also tour the small organic brewery to learn how the brothers brew their beer. Make time for a hearty lunch of traditional German fare at the Gasthaus zum Klosterhof – and don’t be surprised if the local goats make an appearance to wait for your leftovers. 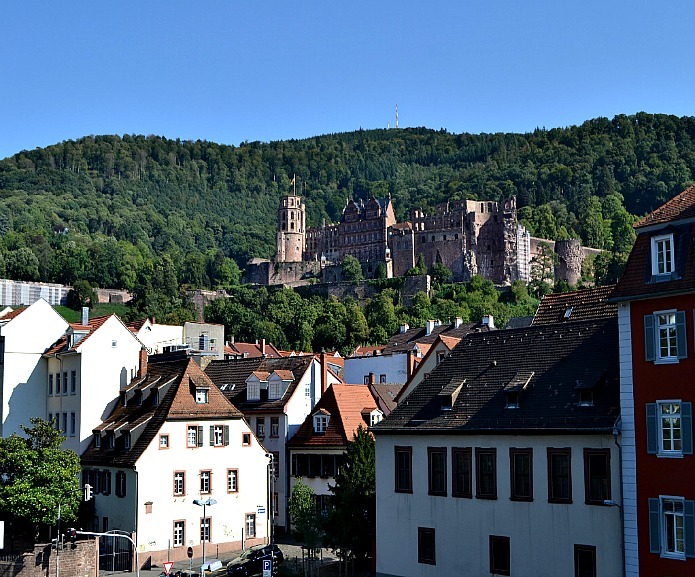 The highlight of any visit to Heidelberg is, of course, a visit to the medieval castle. Destroyed in a war in 1693, the castle ruins have become a symbol of the German Romantic Movement. A funicular railway whisks you up to the top where lovely gardens surround the ruins of the massive Renaissance edifice. The castle ruins – once home to the Prince-Electors – rise majestically above the city’s historic center. 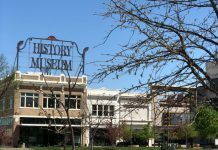 There is an interesting apothecary museum on the castle grounds and you definitely don’t want to miss the world’s largest wine barrel said to hold a capacity of 58,650 gallons – it is empty so no need to bring your wine glass. 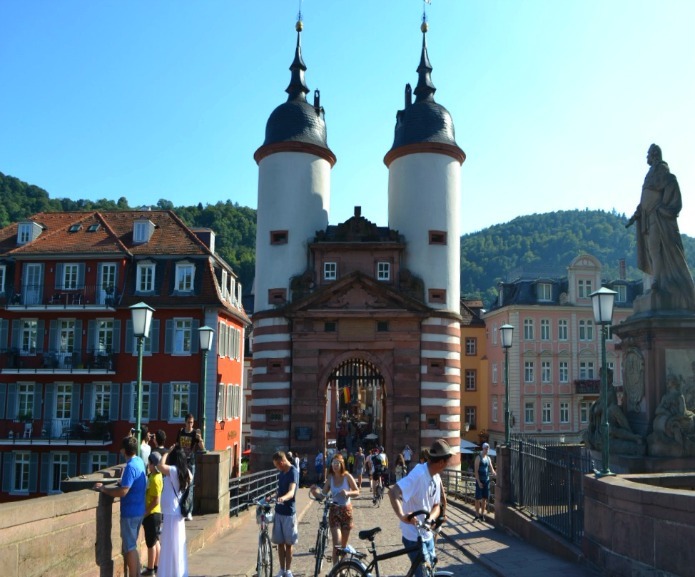 See www.germany.travel.com to plan your adventure to Heidelberg and Germany’s other great cities.